Dhaka Commerce College HSC Admission Notice 2017. The most renowned college for higher secondary certificate study Dhaka Commerce College Intermediate Admission Circular 2017 has been published. Rajuk College HSC Admission 2017 procedure is SMS based like previous year. According to “HSC Admission Curriculum 2017″ There will not be taken any admission test (Neither written test nor viva voce). GPA will be the only parameter for admission in colleges. Dhaka Commerce College HSC Admission 2017 process will proceed according this curriculum. Online Application Start: 26 May, 2017. Online Application End: 9 June, 2017. Selected candidate List of HSC Admission 2017 Publication Date: 16 June, 2017. Like Our Facebook Fanpage facebook.com/resultnotice to get the latest news of Dhaka Commerce College HSC Admission Notice 2017 and get future updates. 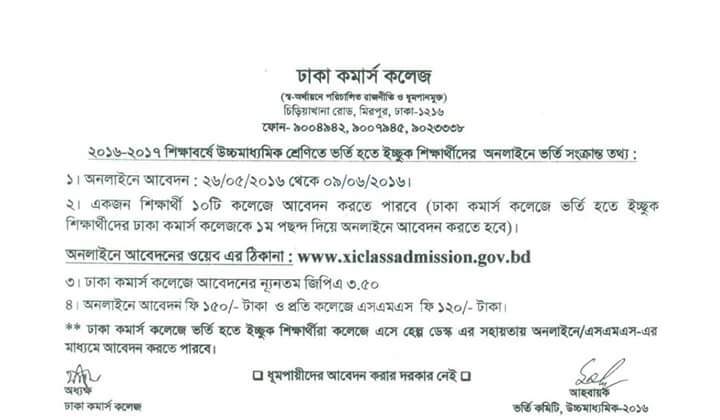 This entry was posted in College Admission, HSC Admission, Notice and tagged Dhaka Commerce College HSC Admission 2015, Dhaka Commerce College HSC Admission Notice 2015, Dhaka Commerce College HSC Admission Result 2015 by Result Gov BD. Bookmark the permalink.